Splayed Social Skills » Harrumph! Occasionally, I wear a kilt. That has become a family thing. My first daughter-in-law, wife of our eldest son, is singularly proud of her Scottish heritage. She’s not a skirt/dress person, but does wear a kilt. Our son does too and so does their son. He is one of the two males pictured here; you can decide which is his image and which mine. 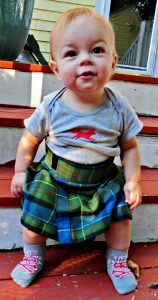 A Scottish neighbor discussed the manners and mindfulness involved in kilt wearing. His was a long tale about a wedding. He was in the groom’s party and sat in the nave during the ceremony. Of course, as a Scott, he was kitted in kilt. During the wedding, he wondered what dementia gripped his wife and other family members. The women he could see gesticulated repeatedly in some indecipherable sign language He smiled faintly by way of acknowledging them but did not get the message until after the nuptials. He was, as I do, wearing his kilt traditionally — with no clothing underneath. The whole church other than those standing or seated with the wedding principals had no doubt of his gender. I thought I had gotten the hang of it. I observed other kilt wearers and saw that most men push the front material in a fold between their thighs, making a crotch curtain. Yet last evening at a fair sized party at our house, my wife crossed the room to provide my own close-your-damned-legs moment. She was more pleasant but the message was the same. In my experience, women are no more polite or considerate than men. Yet nearly all try to preserve modesty when they wear a skirt or dress or kilt. The Sharon Stone Basic Instinct reveal when it occurs is intentional. Men on the other hand (other leg?) do not grow up learning to keep their knees together when seated. For all but men with the least muscled thighs, keeping legs closed when seated allows no hanging room for what the Brits call naughty bits. I enjoy wearing a kilt, for the variety and comfort. I only once was out in the bitter air and wind of winter in one though. I suspect I’ll master the physical and social skill of the seated curtain. I also tend to travel with my kilt watcher to remind me.